JoAnn Wingerter Kopelman passed away on Sunday, August 12, 2018, at the age of 84. Beloved wife of Charles M. Kopelman for 63 years. Mother of Joette Kopelman Monaghan (Joseph). 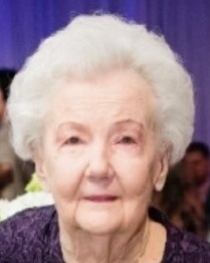 Grandmother of Jessica Monaghan and Jamie Monaghan Fineran (Everett). Great Grandmother of Caroline and Eli Minvielle; and William, Preston and Dylan Fineran. Sister of Kathleen Aucoin, Linda Blanchard and the late Marlene Arceneaux. She is also survived by numerous nieces and nephews. Mrs. Kopelman was a graduate of Charity School of Nursing, class of 1955. She had a successful career as a Registered Nurse with Ochsner Medical Center retiring at the age of 63. Relatives and friends are invited to attend the Funeral Mass at Greenwood Funeral Home, 5200 Canal Blvd, New Orleans, on Thursday, August 16, 2018, at 1:00 PM. Burial will follow in Greenwood Cemetery. Visitation will be held on Wednesday, August 15, 2018 from 5:00 PM until 7:00 PM and again on Thursday, August 16, 2018 from 12:00 PM until time of Mass.